I don’t like getting up early when I travel. I love sleeping in hotels with the air cranked to 64 degrees and the black out shades pulled so I could sleep until after noon and still think it’s the middle of the night. My boss had other plans last Friday. We had to get up well before dawn for our first task of the day. We’d then be able to go back to the hotel and back to bed for several hours before our evening task. We were up at breakfast time though and when I’m up at breakfast time, I want breakfast. We were in downtown Washington, D.C. so I started looking for someplace nearby that didn’t serve “brunch.” I wanted breakfast. Cheap diner food. And what do you know….I found one. 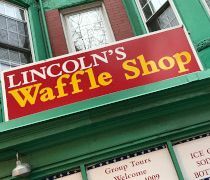 Lincoln’s Waffle Shop is on 10th Street right across the street from Ford’s Theater. This area of downtown D.C. is kind of touristy because of the theater. There isn’t much parking along this stretch of 10th and what little there is was taken up by street vendors getting set up for the tourists that would eventually make their way down to see where Abraham Lincoln was shot. 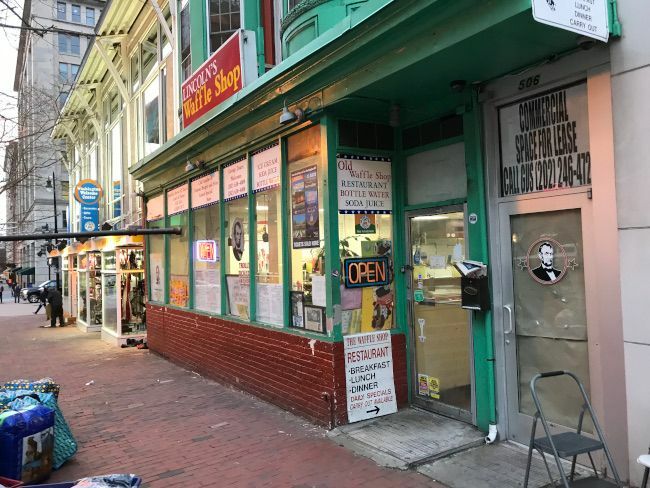 The brightly painted restaurant that has been in this location for over twenty years doesn’t really look like it fits in with the rest of downtown. which is much more polished. 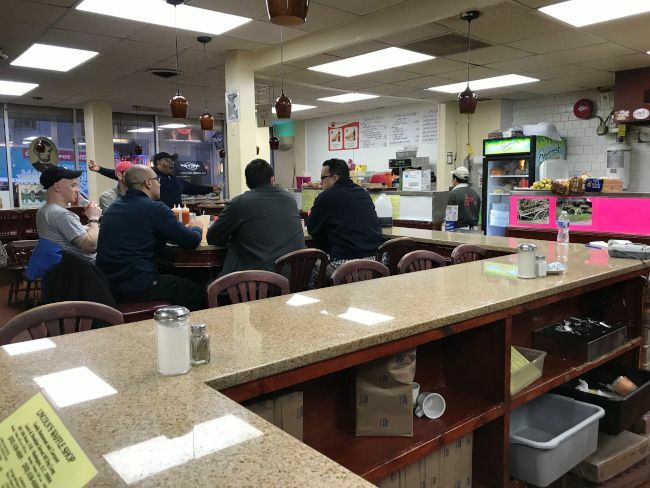 The restaurant is a classic counter service diner. There are large U-Shaped counters so the waitresses never have to leave the kitchen area. 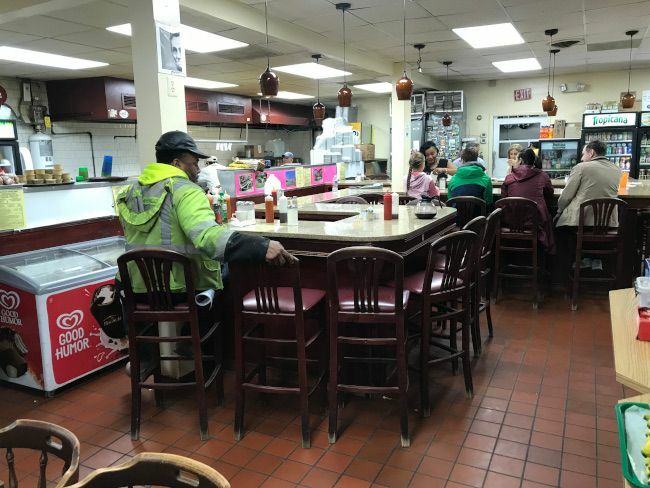 The diner was full of regulars and tourists alike when we walked in a little after 7 AM. We found a couple of empty seats along the far counter and a waitress came over right away with a couple of menus. 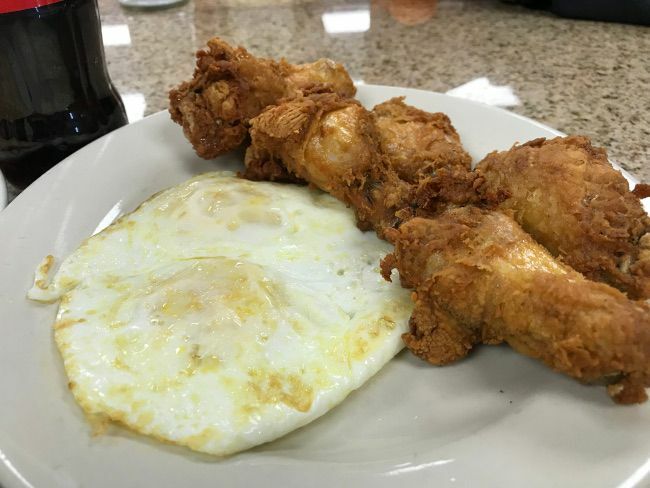 The menu is classic diner fare. They didn’t have either of my usual go-to’s though. No steak and eggs. No Eggs Benedict. I had to go in a different direction. I picked the Waffle served with Chicken Wings and two eggs plus toast. Chicken wings sounded pretty good for breakfast and once the plate was set down in front of me, I was happy this is what I ordered. I started with the two eggs. They were cooked to a nice over medium where the yolk was still runny but it was also kind of starting to come together. The chicken wings served on the same plate were a combination of flats and drumettes. They were breaded and fried up to a delicious crispy exterior. They’re the kind of wings I’ve seen served as Wings Dings before and they were fantastic. The waitress suggested I use their house hot sauce on them but they were good enough on their own. The other half of my meal was a house made waffle. The large waffle was served plain but there was a jar of maple syrup and some butter packets on the table. There’s not much else to say about it.. It was a solid, fresh waffle and the whole meal was very filling. The bill for my breakfast was a little over $16 before tip. Lincoln’s Waffle Shop feels out of place in downtown D.C. which is mostly populated with higher end restaurants. It was a nice break from the places we had been eating because it’s one of those places that feels so familiar. There were several people that came in that our waitress knew by name but there were also tourists who came in with a limited grasp of English and the waitress patiently worked with them to get them what they wanted. 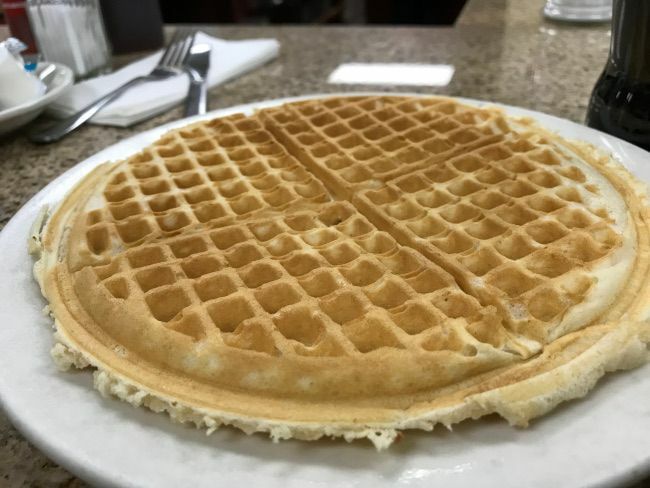 We were looking for a quick, tasty diner for breakfast and we found that in Lincoln’s Waffle Shop.